Rate this project Barry Kauler has announced the release of Puppy Linux 5.1: "The brilliant new Puppy Linux 5.1, code-name 'Lucid' as it is binary-compatible with Ubuntu Lucid Lynx packages, has been released. 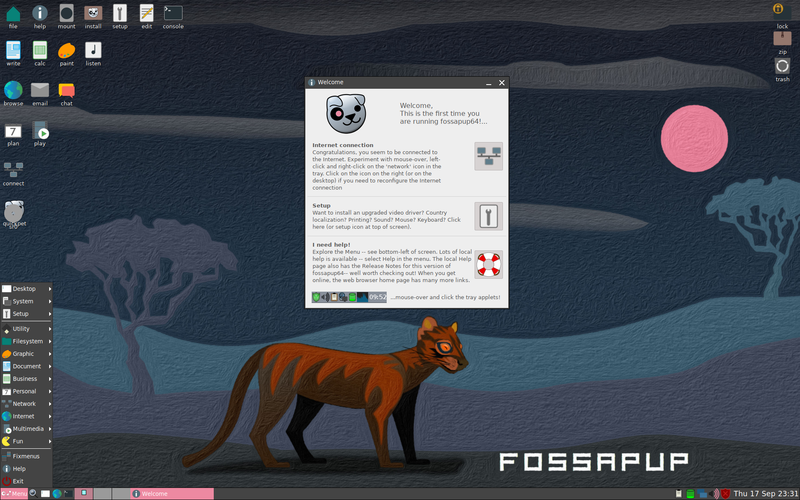 Lucid Puppy 5.1 is a 'full-featured compact distro.' It's a Puppy, so it is fast, friendly, and fun, and it can also serve as one's main Linux desktop. Quickpet and Puppy Package Manager allow easy installation of many of the best Linux programs, tested and configured for Lucid Puppy. Lucid Puppy boots directly to an automatically configured graphical desktop, with the tools to personalize the desktop right at hand, and it even recommends which add-on video driver to use for high-performance graphics..." Further information available in the release announcement and the release notes. Download: lupu-510.iso (130MB, MD5). On a related note, readers who keep an eye on our "Latest Distributions" sidebar or check the DistroWatch Weekly should have already known about the 1.0 release of Puppeee Linux, the Puppy for Eee PC netbooks.